If you read or watch the news, you’ll likely think the world is falling to pieces. Trends like terrorism, climate change, and a growing population straining the planet’s finite resources can easily lead you to think our world is in crisis. But there’s another story, a story the news doesn’t often report. This story is backed by data, and it says we’re actually living in the most peaceful, abundant time in history, and things are likely to continue getting better. 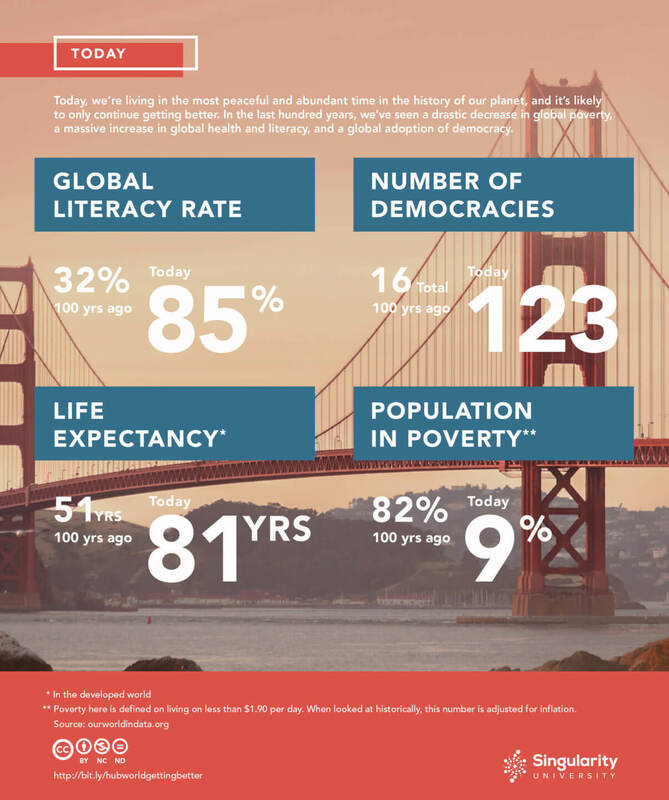 The reality that’s often clouded by a constant stream of bad news is we’re actually seeing a massive drop in poverty, fewer deaths from violent crime and preventable diseases. On top of that, we’re the most educated populace to ever walk the planet. That’s pretty good progress! Maybe the world isn’t all gloom and doom. If you’re still not convinced the world is getting better, check out the charts in this article from Vox and on Peter Diamandis’ website for a lot more data. So now that you know the world isn’t so bad after all, here’s another thing to think about: it can get much better, very soon. In their book Abundance: The Future Is Better Than You Think, Steven Kotler and Peter Diamandis suggest it may be possible for us to meet and even exceed the basic needs of all the people living on the planet today. Throughout history, we’ve seen that in the hands of smart and driven innovators, science and technology take things which were once scarce and make them abundant and accessible to all. In the 1800s, aluminum was more valuable than silver and gold because it was rarer. 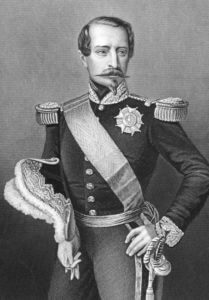 So when Napoleon III entertained the King of Siam, the king and his guests were honored by being given aluminum utensils, while the rest of the dinner party ate with gold. But aluminum is not really rare. In fact, aluminum is the third most abundant element in the Earth’s crust, making up 8.3% of the weight of our planet. But it wasn’t until chemists Charles Martin Hall and Paul Héroult discovered how to use electrolysis to cheaply separate aluminum from surrounding materials that the element became suddenly abundant. The problems keeping us from achieving a world where everyone’s basic needs are met may seem like resource problems — when in reality, many are accessibility problems. Less than two decades ago, when someone reached a certain level of economic stability, they could spend somewhere around $10K on stereos, cameras, entertainment systems, etc — today, we have all that equipment in the palm of our hand. 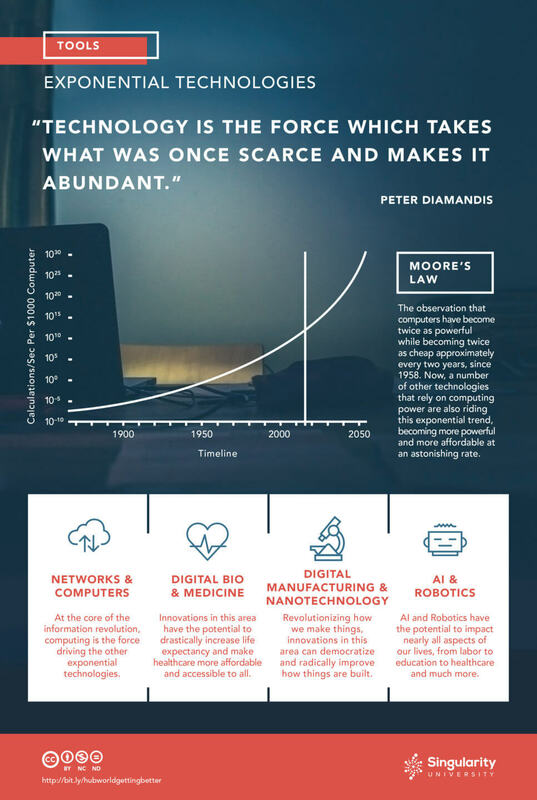 Now, there is a new generation of technologies heavily dependant on information technology and, therefore, similarly riding the wave of exponential growth. 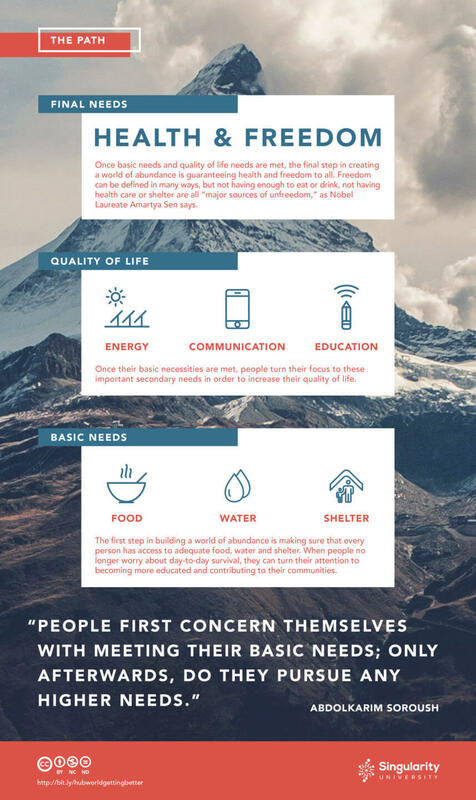 When put to the right use, emerging technologies like artificial intelligence, robotics, digital manufacturing, nano-materials and digital biology make it possible for us to drastically raise the standard of living for every person on the planet. IBM’s Watson Health is being trained and used in medical facilities like the Cleveland Clinic to help doctors diagnose disease. In the future, it’s likely we’ll trust AI just as much, if not more than humans to diagnose disease, allowing people all over the world to have access to great diagnostic tools regardless of whether there is a well-trained doctor near them. Solar power is now cheaper than fossil fuels in some parts of the world, and with advances in new materials and storage, the cost may decrease further. This could eventually lead to nearly-free, clean energy for people across the world. Google’s GMNT network can now translate languages as well as a human, unlocking the ability for people to communicate globally as we never have before. Self-driving cars are already on the roads of several American cities and will be coming to a road near you in the next couple years. Considering the average American spends nearly two hours driving every day, not having to drive would free up an increasingly scarce resource: time. Today’s innovators can create enormous change because they have these incredible tools—which would have once been available only to big organizations—at their fingertips. And, as a result of our hyper-connected world, there is an unprecedented ability for people across the planet to work together to create solutions to some of our most pressing problems today. 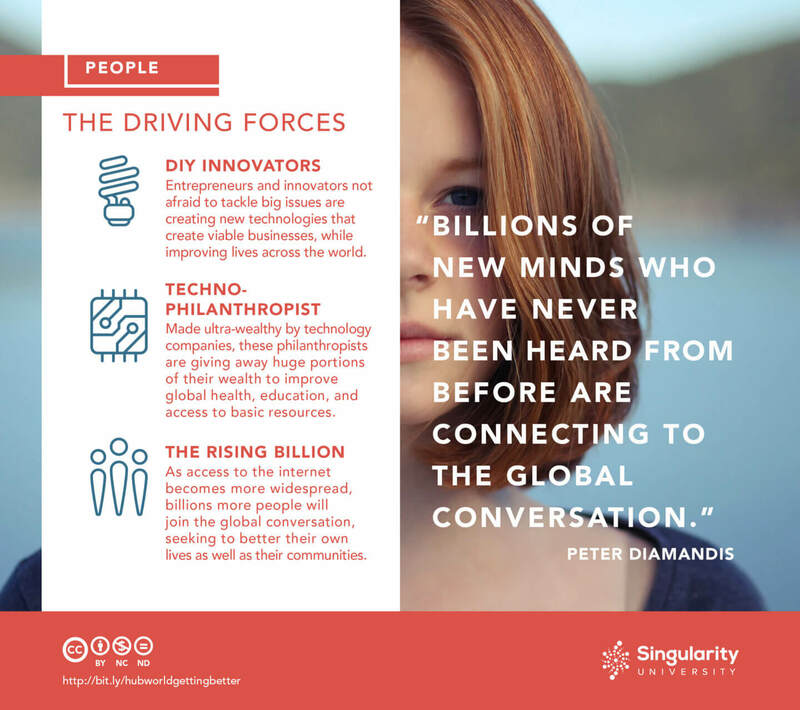 According to Diamandis and Kotler, there are three groups of people accelerating positive change. In the 1970s and 1980s, the Homebrew Computer Club was a meeting place of “do-it-yourself” computer enthusiasts who shared ideas and spare parts. By the 1990s and 2000s, that little club became known as an inception point for the personal computer industry — dozens of companies, including Apple Computer, can directly trace their origins back to Homebrew. Since then, we’ve seen the rise of the social entrepreneur, the Maker Movement and the DIY Bio movement, which have similar ambitions to democratize social reform, manufacturing, and biology, the way Homebrew democratized computers. These are the people who look for new opportunities and aren’t afraid to take risks to create something new that will change the status-quo. Unlike the robber barons of the 19th and early 20th centuries, today’s “techno-philanthropists” are not just giving away some of their wealth for a new museum, they are using their wealth to solve global problems and investing in social entrepreneurs aiming to do the same. The Bill and Melinda Gates Foundation has given away at least $28 billion, with a strong focus on ending diseases like polio, malaria, and measles for good. Jeff Skoll, after cashing out of eBay with $2 billion in 1998, went on to create the Skoll Foundation, which funds social entrepreneurs across the world. And last year, Mark Zuckerberg and Priscilla Chan pledged to give away 99% of their $46 billion in Facebook stock during their lifetimes. Cisco estimates that by 2020, there will be 4.1 billion people connected to the internet, up from 3 billion in 2015. This number might even be higher, given the efforts of companies like Facebook, Google, Virgin Group, and SpaceX to bring internet access to the world. That’s a billion new people in the next several years who will be connected to the global conversation, looking to learn, create and better their own lives and communities.In his book, Fortune at the Bottom of the Pyramid, C.K. Pahalad writes that finding co-creative ways to serve this rising market can help lift people out of poverty while creating viable businesses for inventive companies. Of course, progress doesn’t always happen in a straight, logical way, but having a framework to visualize the needs is helpful. You can download the full “Path to Abundance” infographic here. It was created under a CC BY-NC-ND license. If you share, please attribute to Singularity University.